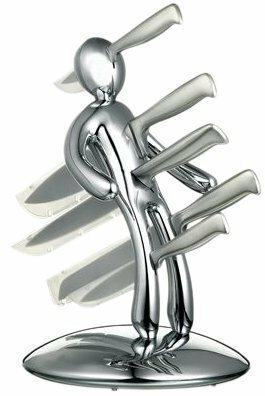 Voodoo Knife Block - the knife man that helps cooks and has magical powers ..... voodoo spells in the kitchen!.. Cupids little twist - a dagger through the heart!.. Sharpen your throwing skills with the blue bullseye knife block..
Don't leave it the matador - you can drive in the sword yourself - or at least stab in the knives. .. Wooden knife blocks with hidden magnets - how cool is that?..